Fried foods…we all love them. Operators know they bring in customers and a quality product keeps them coming back. When working with operators, one question we get asked a lot is “What is your least expensive fryer?” I often reply, “How long do you plan on being in business?” I ask that question as the least expensive economy fryer we sell is often the most expensive fryer to own over its lifetime. The costliest part of operating a fryer is not necessarily the upfront cost of the equipment but more a factor of the ongoing costs of frying oil followed closely by energy consumption the longer it is in use. Oil quality is affected by many factors most notably sediment, excessive temperature, water, air, light, and salt. Oil life can be extended through the process of regular filtration with filter media and filter powder. This can be done manually with a gravity cone, with a motorized portable filtration unit or through a built-in filtration system with the latter being much more conducive to multiple filtrations throughout the day. Oil quality is measured in several different methods with the most accurate being TPM or percentage of total polar materials. Fresh oil starts out in a clean fry pot with a TPM of around 6 and that number begins to rise with time and number of cook cycles. As TPM levels exceed 25, flavor profiles start to change and the oil begins to smoke as its flash point approaches the set point of the fryer and it needs to be discarded. In most fryers, the cold zone is an area of the frypot located beneath the heat source whether that is a gas tube or electric element where crumbs and food particles can collect and be held at a lower temperature than the fryer setpoint so as not to burn in between filtrations. In a typical 50 lb frypot, up to one third of the oil volume is reserved for that cold zone and not really used for cooking product. Without regular filtration, oil life can be as little as 1-2 days. In areas with more reasonably priced electricity such as the Southeast, electric fryers have also proven themselves to be a solid option to gas. With the elements submersed in the oil, over 90% of the energy consumed goes directly into the oil to cook product rather than up the flue and into the kitchen raising room temperatures. A typical gas fryer runs in the 40-50% efficiency range and even a high efficiency gas rarely exceeds 65-70% under the best conditions. A cooler running fryer can help to reduce HVAC costs which is all part of the cost equation. 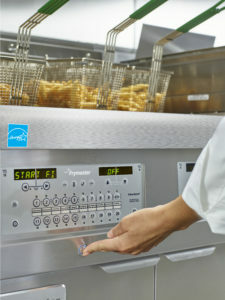 The actual cost of ownership over time is the real number to analyze when considering a new fryer. Feel free to contact our Frymaster brand champion to discuss fryer filtration and efficiency options to best suit your needs.